In the Performance: Comfort video we discuss winter temperatures, energy bills, and the money saved by investing in high-performance glazing & extra insulation. 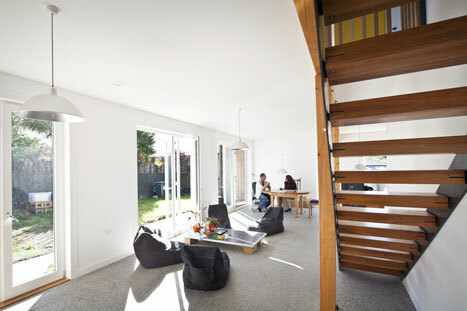 The Solar Access and Passive Heating & Cooling pages describe our design approaches to making the house warm and dry. The Walls and Windows pages demonstrate the construction methods and products used to achieve comfort. Our project has many goals, including Zero Energy, water efficiency, and waste minimisation. But the core reason we chose to build a house was we wanted a home that was comfortable to live in. In fact, all of the other goals are secondary; there's no point minimising use of natural resources if you don't enjoy living in your house. We firmly believe there doesn't need to be a compromise. Through good design and the use of the right products & materials a house can be both good for the environment and comfortable for its inhabitants. One of the key components in achieving comfort without heating is the double layer of insulation installed in the walls and roof. You can read more about the wall construction and use of GreenStuf insulation on the Walls page. Air temperature. Temperature of surrounding air, shielded from radiation and moisture. Radiant temperature. Temperature radiating from surrounding objects. Humidity. Amount of water vapour in the air. Air speed. Rate of movement of air. Metabolic rates. Varies from person-to-person and activity-to-activity. The last two items on the list are related to people, and their interaction with the building. For example when we are sleeping a duvet will increase the clothing level, which means the air temperature can be slightly cooler without changing the degree of comfort. The first four factors are environmental and are controlled at the Zero Energy House through design and the products & materials used. Air speed is controlled by a tight building envelope and the ability to control ventilation through the dual-tilt windows installed. Temperatures and humidity are controlled through passive solar design utilising the thermal mass of the concrete slab and, again, the tightness of the building envelope. Sensors monitor temperature and humidity throughout the house. Humidity analysis will be published at a later date; the temperature results are as follows. Achieve consistency of temperatures between the living and bedroom areas, so the house would be warm throughout. The chart below presents half-hourly temperature readings over a six week period (June 1 - July 10) for the lounge (downstairs), master bedroom (upstairs) and outside. High-performance glazing is an essential part of the efficient building envelope. We used N70 glazing from MetroGlass, which is double-glazed, argon-filled, and has a non-reflective Low E coating. Read more on the Windows page. Consistency of temperatures between living area and bedrooms (average upstairs temperature of 19.8°, average downstairs temperature of 19.4°). We don't use any heating systems in the house. Instead, we heat the home passively using energy from the sun (and some internal gains from people and appliances within the space). That heat is captured during the day in a concrete slab on the ground floor and then released overnight. Heat released from the slab is retained within the house by an extremely efficient building envelope, which has a double layer of insulation and high-performance glazing. The thermal mass and building envelope work together to keep temperatures relatively stable through day and night. Internal temperatures drop by around 3° overnight, from when the sun sets (20° at 6PM) until when it rises (17° at 7.30AM). Once the sun begins to heat up the inside of the house there is a jump in internal temperatures (between 9AM and 10.30AM temperatures increases from 17.2° to 18.6°). Temperature decreases inside are less variable than outside, as a result from absorbed heat being released by the concrete slab overnight and retained by the tight building envelope. While it's not a driver of thermal comfort, the light in the house has made a real difference over winter. It's been much lighter than other house we've lived in, which have tended to get gloomy in winter months. This result has been achieved largely through the big area of glazing on the north side of the house, but also by the choice of paint. Studies have found a third of energy use from lighting can be impacted by factors such as the colour and reflectivity of paints. We deliberately chose a paint colour throughout that would reflect light well, and have noticed our use of lights over the winter has been minimal. Even the rooms of the south side of the house that don't get direct sunlight feel light as a result of this. Downstairs shot, end of May. Upstairs shot, end of May. Our energy bills over winter were around $1.80 a month. 30% of the average Auckland household's energy consumption is for space heating, and most of that is in winter when prices for power are higher. Building the house to avoid the need for heating has effectively eliminated this 30% and the bills that come with it. Other aspects of the house - such as LED lighting, energy-efficient appliances, and solar water heating - also reduce our energy consumption, to a point where over winter we consumed around a quarter of the amount of energy a typical Auckland home uses. Over the coming months we'll add this analysis to the energy performance page and include a breakdown by each major circuit in the home to show where the savings have been made. As well as being energy efficient, we're obviously generating a lot of our own electricity off the PV array. Over the winter months we've generated around 30% more energy than we've used. However, we still rely on a connection to the grid like any other home. Because we're not storing electricity on-site, we feed surplus energy back to the grid (typically during the day, when generation is high but we may be away from home) and then buy energy back from an electricity retailer at night. For the three month period the net energy cost was $5.34, or $1.78 per month. By avoiding the need to heat the home we expect to save more than $12,000 over 25 years. The Zero Energy House has more wall & roof insulation, edge insulation around the concrete slab, and high-performing glazing - but it doesn't require heating. A house built to building code has less insulation and lower-spec glazing, but needs to install (and run, maintain, and replace at the end-of-life) a heating system. The comparative costs are shown in the table below. Up-front construction costs are higher for the Zero Energy House, but in eliminating the need for heating our expected savings over 25 years are $12,711.92. After 25 years the Zero Energy House will continue to stay warm without heating whereas a house built to code would continue to incur costs to operate, maintain, and replace heating systems. We haven't factored in finance costs or inflation. After the water and energy performance phases we'll consolidate all the project costs and present them with these factors taken into account. Wall & roof material and labour costs have been calculated using rates in the Rawlinsons New Zealand Construction Handbook 2012 edition. Window costs are based on a combination of data - the costs of our windows, quotes obtained during our design phase, and data from the Rawlinsons handbook (ref. footnote 1). 'Zero Energy House' window cost is for argon-filled, thermally-broken aluminium frames with low E coating. We have not included the additional cost for timber framing as thermally-broken aluminium framing would retain the same level of heat. The 'ZEH to building code' cost excludes thermally-broken frames, argon fill and low E coating. Heating system costs have been based on the installation of two large room heat pumps (one per floor) with costs from the Rawlinsons guide (ref. footnote 1). 25-year heating cost is based on 3,630kWh per annum at an energy price of $0.28/kWh and with a system Coefficient of Performance of 3.2. The 3,630kWh per annum figure is based on heating a home our size to a target temperature of 20° within the Auckland climate. Number of heating system replacements is based on 10-year system lifetime as recommended in Heating, Ventilating, Air Conditioning and Refrigeration Guide by The Chartered Institution of Building Services Engineers. We have assumed 10% improvements in cost-efficiency of systems with each 10-yearly replacement. This is based on figures in the Heat Pumps Technology Brief published by the International Renewable Energy Agency, which indicates a 30-40% reduction in heat pump heating services by 2050.